The strategy of loading the Fall Rail Fence quilt last weekend so that I could make passes on the long arm as I had a few minutes during the week seems to have worked. 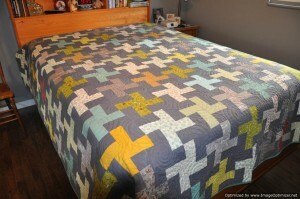 I finished the quilting on this one Friday night. 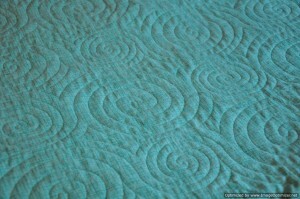 The quilting pattern is called, Swirls. This is the backing. I love the trees and bright background on this one. I now need a strategy to get the binding attached! This morning, we woke up to a layer of freezing rain covering everything. Although the ice coating on everything is pretty, it is definitely not safe to be driving or walking in this weather. It was safe to stay inside and quilt though. 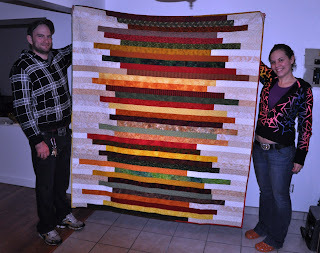 By 11:00 pm, I had finished making all the blocks for the Got Stripes quilt – with the exception of one. I was short a green background strip. 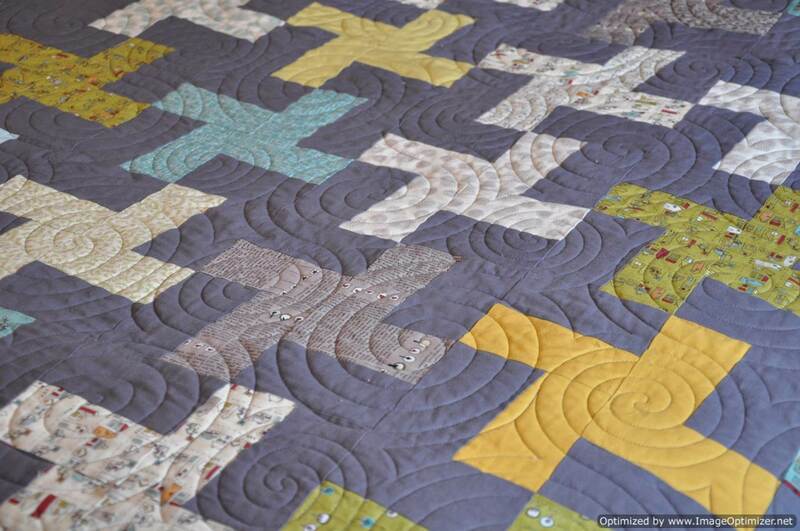 I need to cut some green background pieces to finish the last block and to replace some pieces in a block that is already pieced into the quilt top. I made the mistake of reversing one piece of background fabric–front for back so I will need to do some reverse sewing. I also finished the binding on my Fire Escape quilt. 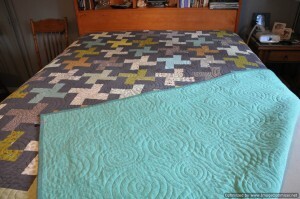 After finishing the binding, I spread the quilt out over the table to take a picture. 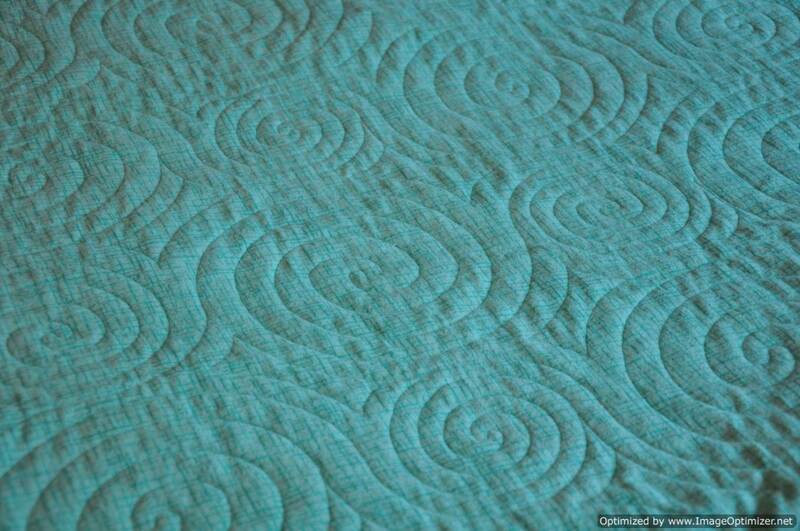 A picture without the flash shows the colours of the quilt to be a little closer to reality and shows the swirl quilting design a little better. Tonight was the housewarming party for our daughter and her fiance. 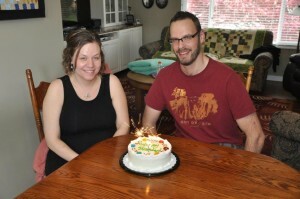 They took possession of their new house on September 1, 2011. My daughter had expressed interest in my Line Art / Skinny Strips flimsy when it was on the design wall so I quilted it up and presented it to them as a housewarming gift. This is the Frogs Warm Wishes quilt again–shown in a previous post (scroll down). The binding is finally finished. 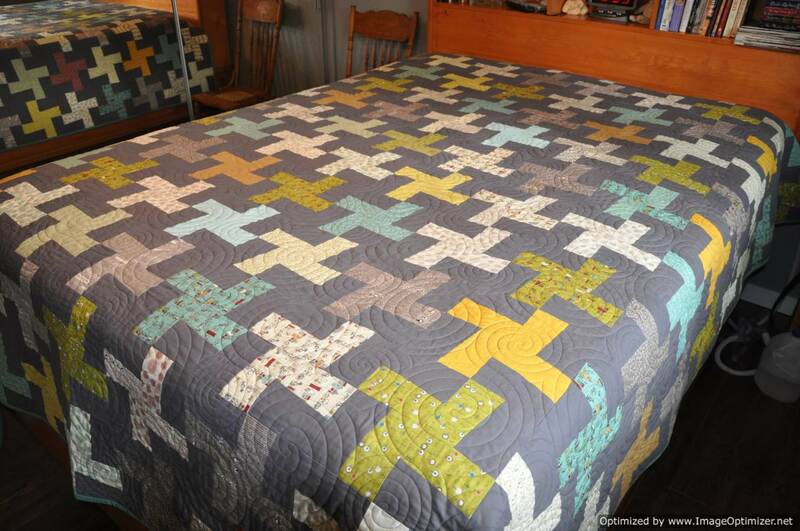 I had hoped to have this quilt finished sooner, but other commitments were competing for my attention lately. 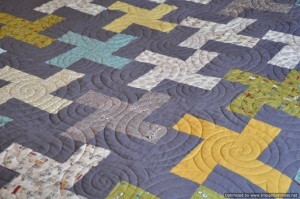 I have mentioned before that this is one of my favorite quilt patterns. I just love the “recipe“–a focus fabric or novelty print and 3 contrasting fabrics drawn from the colours in the print. A dash of a fourth fabric drawn from the colours in the novelty print can be added as an inner border to add punch if desired. This is a picture of the quilt back. 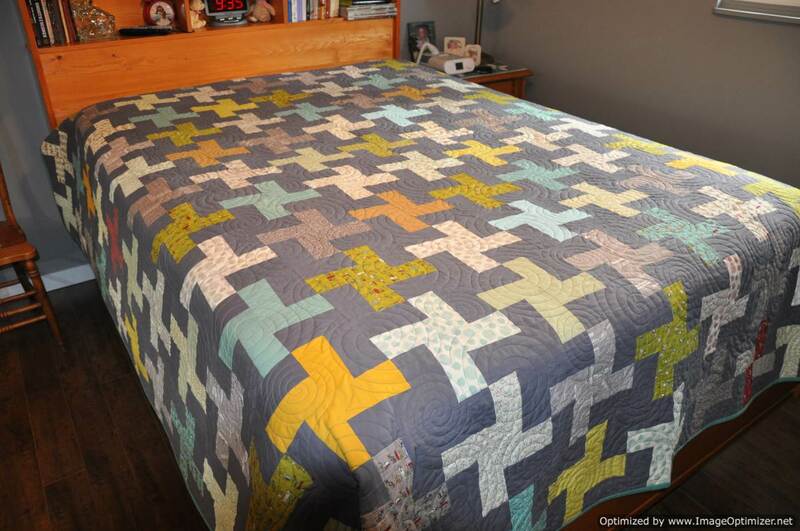 I was determined to bust stash with this one so I used all of the leftover fabrics from the front of the quilt and added two pieces of green from my stash to make the piece large enough to use as backing for this quilt. While surfing the Internet, I discovered a site with interesting facts about frogs. This site mentioned that frogs are a protection symbol for children and promote pleasant dreams. I didn’t know this about frogs when I made the quilt, but in hindsight, this information confirms that this will be a great quilt for a young child some day!